Popular Local Band Tatewari Plans International Tour! Tatewari (Abuelo Fuego) is a talented group I have been following here in Puerto Vallarta for several years. They play weekly (Wednesday nights from 9:00-11:00 PM) at Cuates y Cuetes, next to the pier in the Zona Romantica. 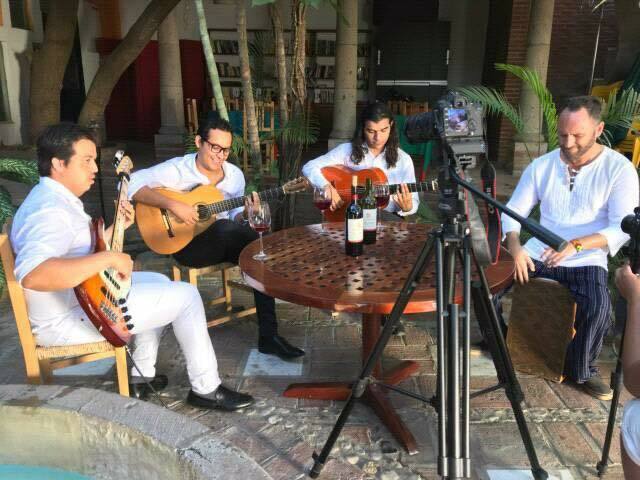 The group is made up of three fellows who grew up together in La Cruz de Huanacaxtle and began playing guitar at a very young age. Their music is a very accomplished Flamenco guitar, gypsy and classical jazz with a touch of traditional Mexican sounds. Recently I had the opportunity to go up the coast for a performance in their home town. It was indeed a treat for us as it was for them to be performing for their local friends and fans from over the years. The Octupus’ Garden (Jardin del Pulpo) in La Cruz was packed with an enthusiastic crowd. After the concert I had a chance to sit down with Esaú Galván and chat about his childhood, his developing career as a master Flamenco guitarist and his plans for the future. La Cruz was primarily a fishing town. As a young boy, Esaú accompanied his father, sometimes for a week at a time, on fishing trips for his business. The town, he told me, was quite different in those days as the Marina had not yet been built. According to him it was tranquil, close knit and a wonderful place to grow up. The construction of the Marina actually required land fill all the way up to the the spot where the residents used to enjoy sunsets, the waves, and a swim at the beach. Much has changed but the town maintains a peaceful yet vibrant atmosphere fed by the sail boats and tourists attracted to the marina. Esaú studied with well known guitarist Wolfgang (Lobo) Fink, took classes in Guadalajara, studied music at the University in Tepic and more recently was able to travel to Spain to study flamenco guitar with a maestro at the Academia Cañarroto El Entri in Madrid. He recounted with fondness his experiences, stories of his fellow students from around the world, and his impressions of Madrid and Granada during his fruitful three month stay. Since at least 2006 he and his lifetime friends Dani Márquez and Alberto “Mimi” Ramirez have formed the group Tatewari. Canadian friend and artist Sonny Davis joined them in 2011 bringing an added element to the band. These four talented guys are currently planning a 2019 Western Canada Tour for which they have set up a gofundme site to reach out to fans for help with the many expenses involved. As they have an ever growing base of devoted fans, this should be very successful. I definitely am one of those devoted fans who are supporting this effort. I hope you will visit tatewarimusic.com, enjoy their music and gallery of videos and photos and take an active part in making this happen. YOU can be part of the action! When I asked Esaú what his dreams for the future were he did not hesitate. “To play”, he said without a second thought. Let’s all help make this dream come true and bring the magic of Tatewari’s music to the rest of the world. 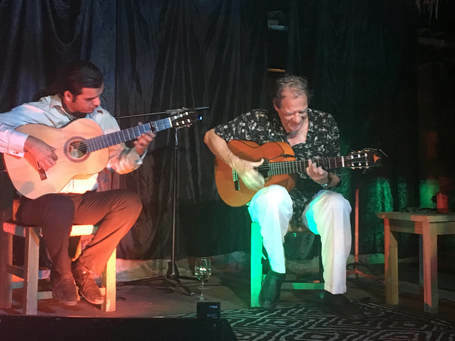 Famed gypsy guitarist Wolfgang (Lobo) Fink and his former student Esaú Galván Saltos, already recognized in the Puerto Vallarta area for his individual work and that with band Tatewari, joined together billed as Lobo Y Jaguar in concert at Octopus’ Garden (Jardin de Pulpo) in the town of La Cruz de Huanacaxtle. Bavarian born Wolfgang Fink traveled to Mexico in 1980 after a successful career in Europe where he studied and spread the joy of gypsy music. He spent time living and studying with gypsies in the Caves of Sacromonte in Granada, Spain. 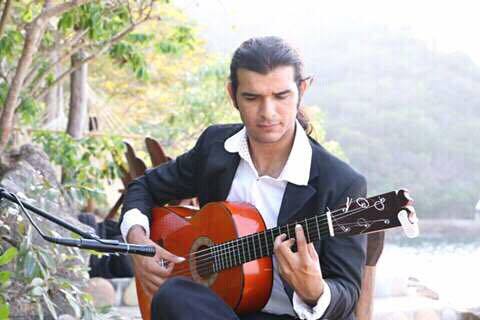 Lobo, among the most accomplished flamenco guitarist in Mexico today, became well known and loved in Puerto Vallarta and San Miguel de Allende performing and recording with friend Willie Royal (who, sadly, recently passed away) as Willie and Lobo. He continues to mesmerize audiences solo or paired with other talented musicians like violinist Geo of Duende and Guitarist Latcho in several venues in the Banderas Bay Area. Living in La Cruz de Huanacaxtle, he met Esaú Galván when he was a youngster of 14. His work with him on guitar jump started Galván’s studies heading him down a successful career path as accomplished Spanish Guitarist. He continued his development at University and with masters in Guadalajara and later in Madrid, Spain. 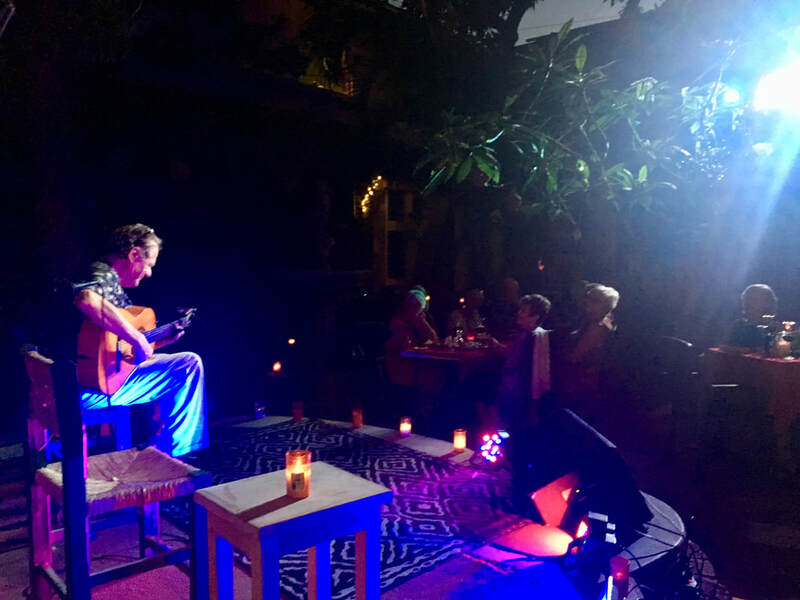 Last Saturday night in the intimate courtyard garden of El Jardin del Pulpo in La Cruz de Huanacaxtle, the two musicians sat down together and treated the audience to an inspired, improvised rendering of Gypsy and Spanish guitar music that took our breath away. The program began with Lobo playing Mexican Rumba Flamenco followed by the more serious Flamenco of Soleares which he referred to as the “Mother of Flamenco”. He then introduced Esaú Galván who’s elegant solo numbers enchanted the sophisticated music loving crowd. At the beginning of the evening, Lobo asked us to “...remember, live music is simply better”. By the end of the performance, no one would have argued with him about that. Let’s hope the duo will continue to collaborate offering many more opportunities to enjoy the marvelous music of masterfully performed gypsy guitar! 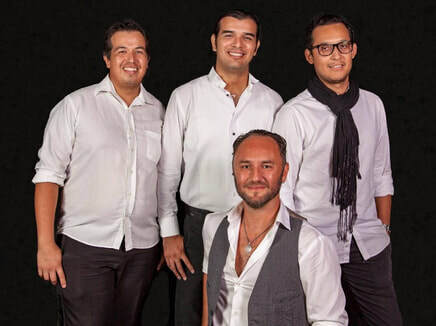 Lobo can often be seen at Incanto in Puerto Vallarta and Esaú performs at several venues around town including a Wednesday night performance with group Tatewari at Cuates y Cuetes next to the pier in the Zona Romantica at 9:00 PM. You can also find Esaú on YouTube and on their website TatewariMusic.com. Octopus’ Garden hosts frequent musical events and you can visit their website for their upcoming events at octopusgardenoasis.com and Tree House Bar on Facebook. Our local musicians work does not stop at the venue. Do you ever think of how and where their CDs and music videos, an important way for them to spread their work, are made? The job is quite complicated. There are selection of location, creative filming, sound considerations, mixing and production to consider. I had a chance to chat with Dani Márquez of the group Tatewari as he worked on the sound system for Cuates y Cuetes 22nd Annual Jazz Festival a few weeks ago. 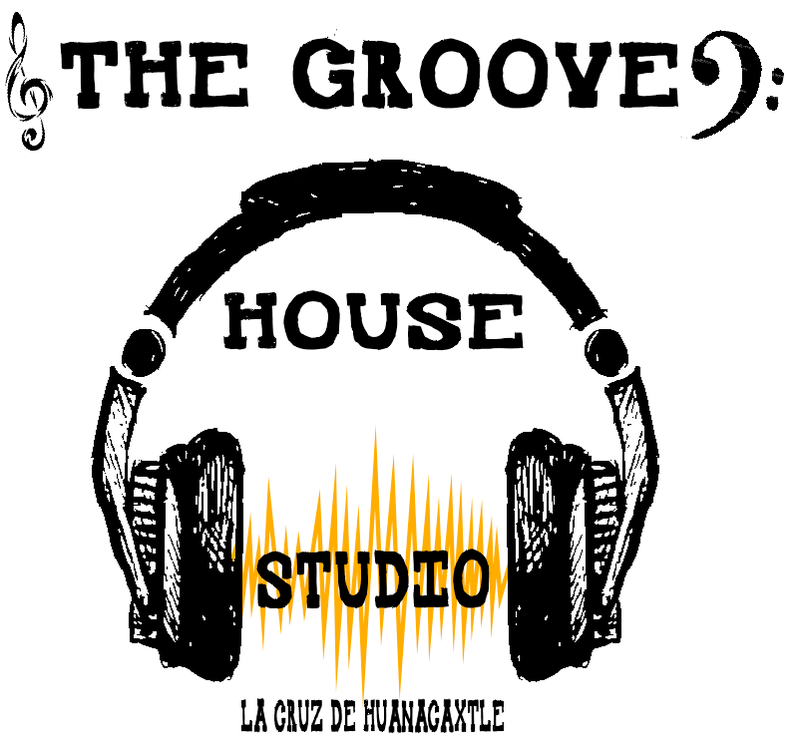 He told me about the creation of the Groove House Studio in his home town La Cruz de Huanacaxtle. As part of Tatewari he wanted to address production issues for them and for other local groups. He is working to expand the business including hopefully honing his skills through study at a prestigious recording company in the US this summer. You can contact Dani at 322 173 9968. A recent product of the group’s cooperation is “Tangos La Parota”, a beautifully executed video of Tatewari, artistically illustrating some of the recording process. (You can enjoy it on YouTube.com or their Facebook page Tatewari Music.) The production is totally done by the members of the talented group. Esaú Galván composed the music, Dani’s company recorded and mixed the sound and of course it is excellently performed by Esaú Galván, Al Ramirez and Dani Márquez with Sonny Davis and Gary Flores on cajon. The video is produced by Wayotl Films of Bucerias. All of us here in Vallarta who love music hope for the best for our favorite musicians. The ingenuity and hard work they put into their careers is amazing. They deserve our respect and support. If we wish to continue to hear the quality of music to which we are accustomed here in this paradise we should stand behind and support them in any way possible. Tips are important as are purchases of CDs. Tatewari is planning a tour to Western Canada in 2019—see tatewarimusic.com for details. 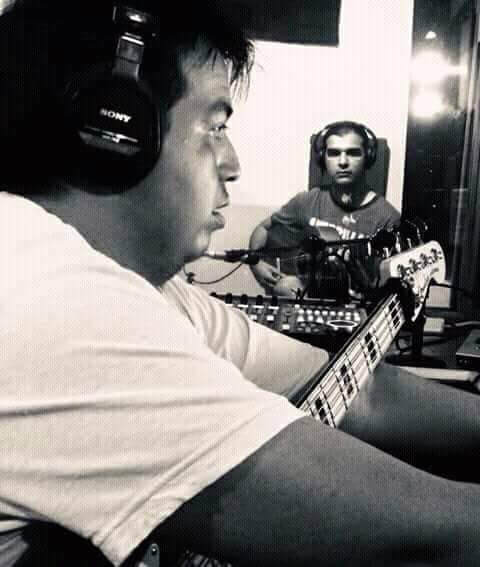 You can hear Tatewari in person at Cuates y Cuetes next to the pier in the Zone Romantica on Wednesday nights 8:00 PM, see their videos on YouTube, and spread the word to your friends. There is no such thing as too much music! Are you planning a destination wedding? Then Puerto Vallarta might just be the place. My daughter and son in law married here a few years ago. It was a beautiful ceremony held at the Hacienda San Angel overlooking the bay and the town and filled with incredible antiques. 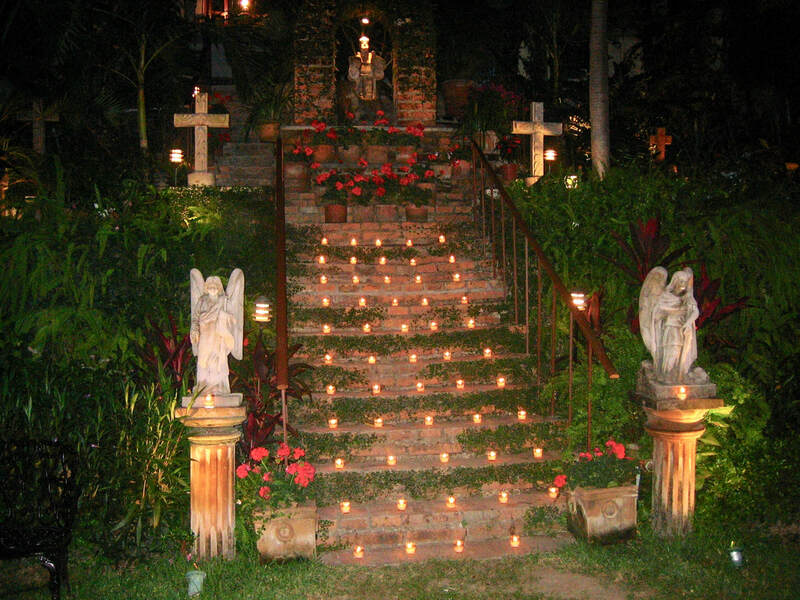 The party after the ceremony was held at romantic Casa Leonardo on the River Cuale. Music is always an essential part of your ceremony and Puerto Vallarta has many wonderful musicians. A current favorite is Guitarist Esaú Galván Saltos for the ceremony and group Tatewari to play fiery gypsy music for the party. They offer both authentic flamenco music as well as more traditional pieces to make your special occasion perfect. You can see them on YouTube and on their website tatewarimusic.com. For additional wedding planning information consult one of the many wedding planners in the area like puertovallartawed.com. They can put you in touch with chefs and inspired venues you might consider from beach settings to elegant private villas and also handle the logistics of the event in as much detail as you require. Your friends and family can chose from the multitude of vacation rentals, airbnbs, and hotels for their stay. 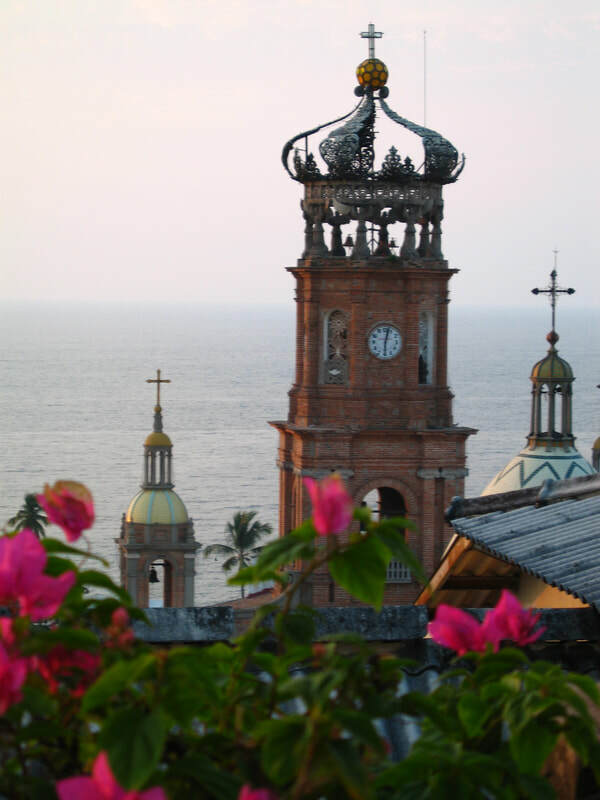 Flights to Puerto Vallarta are plentiful from most areas in the US and Canada. The best months for your Puerto Vallarta wedding are mid November through April, but even early summer can be delightful. Puerto Vallarta is considered in the top 10 of world-wide favorites among brides so you need to plan ahead and now is a good time to start. Summertime and the Living' is Easy...??? Snowbirds and Expats, ever wonder what happens to the music scene down here once you leave? Well, several venues are still very active showcasing the great local talent who might have been overshadowed by the big venue entertainers who visit from other countries during the high season. Since the groups from this area are my favorites, I plan to enjoy lots of great music. 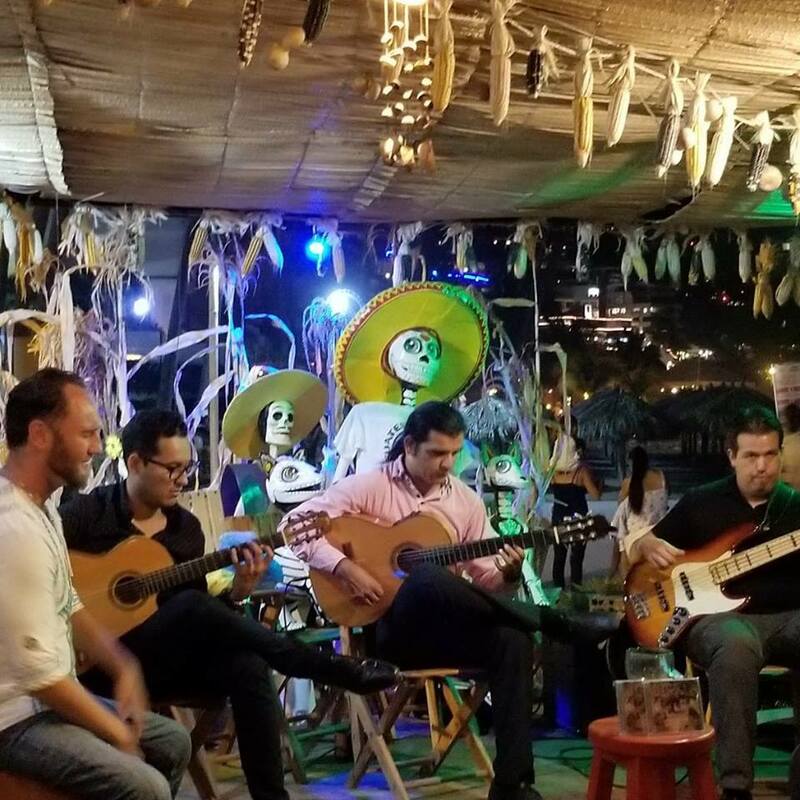 Venues like Cuates y Cuetes next to the pier in the Zona Romantica offer quality acts to keep those of us who brave the summer months as well as local visitors entertained. Gypsy jazz group Tatewari continues to fire up the evening on Wednesday nights at 9:00 and Moruno brings us more “jazz hot” on Sundays and Tuesdays. Cuates y Cuetes also has great music at brunch/lunch time. Esaú Galván Saltos plays Flamenco guitar on Saturdays, Nacho Flores (of Moruno) and friend Magali Uribe play beautiful traditional pieces Wednesday and Thursday, and Friday I just caught a lively set by Diego Mateos, Oscar Terrazas, both of Moruno, with invited guests. 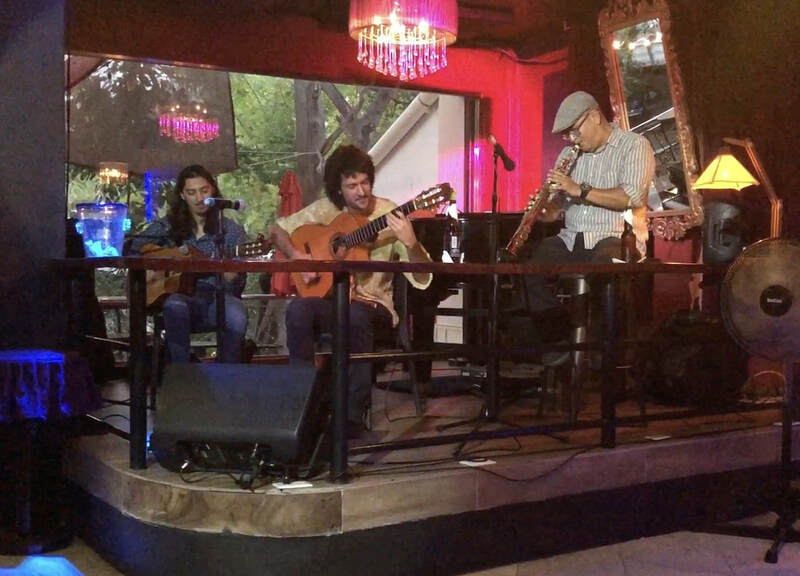 Incanto on Insurgentes next to the River Cuale will be offering great vibes from its Piano Bar and Cabaret (to be announced). 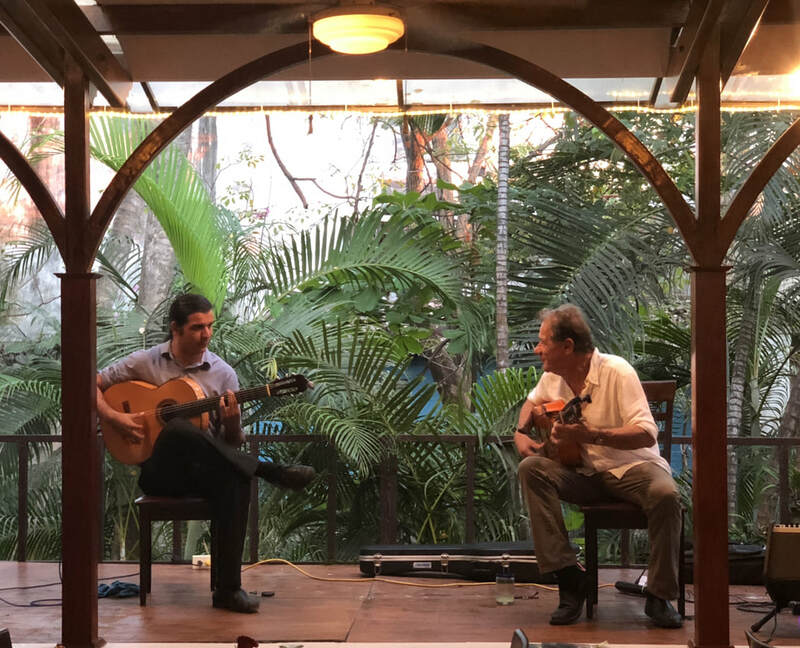 River Cafe right on the River Cuale is beefing up its music program, recently featuring renowned flamenco guitarists Lobo (Wolfgang Fink) and Esaú Galván Saltos playing exciting flamenco guitar. Summer is also a time for our favorite musicians to plan for the year ahead. I know the fellows from Tatewari will be working hard on their new CD (number 4) which should be out by summers end. They will be producing marvelous videos of their new music and scouting out places to play when they make their 2019 Western Canada Tour a year from August. (See their website Tatewarimusic.com for more info). 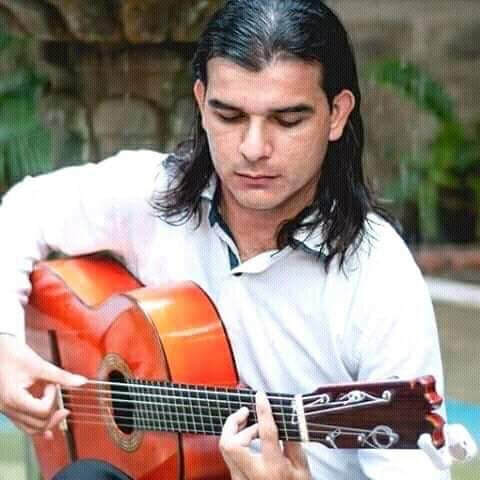 Esaú Galván Saltos in addition to his many commitments performing for weddings and other private celebrations, will be occupied composing Tatewari’s new music. The entire group including Esaú, Al “Mimi” Ramirez, Dani Márquez and Sonny Davis will work on the arrangements. Dani at his Groove House Studio will be mixing and recording the music for their CDs and videos. Sonny will network with Canadian Venues for 2019 tour as well as keep us updated on their website about local events at tatewarimusic.com. So, as you can see, Summer is a very busy and productive time for our musician friends and the end result is more, and even more inspired, music for you when you return in the Fall.